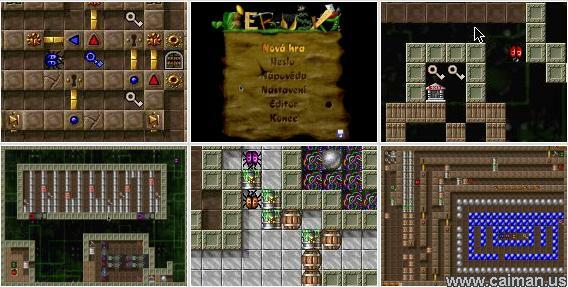 Caiman free games: Berusky by anakreon. This is a very good and difficult sokoban clone. You control up to five ladybirds. 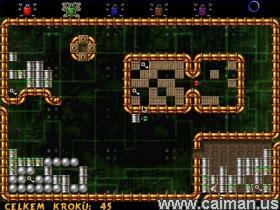 In this game you have to collect five keys (it will unlock the exit of the level) and reach the exit. However it is very complicated because a level is full of boxes, rocks (which can be destroyed only with a laser or a pick) and various other obstacles. So unless you are an expert of sokoban games I highly recommend to try the training levels at first, because it will introduce you to all the things available in the game and also requires some thinking. This is a huge game, 120 levels, 4 difficulty levels: training (10 levels), easy (50 levels), intermediate (35 levels), hard(20 levels), impossible (5 levels). 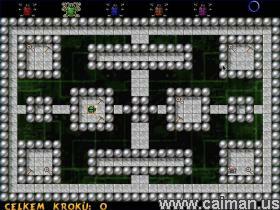 If you completed all the levels or you want to create your own, there is also a level editor. Sadly the game is only available in Czech.